I entered Hallmark with the intention of finding a card for a friend, and discovered a happy thing. 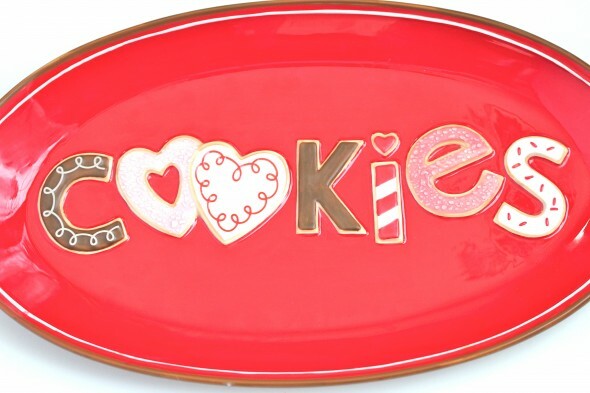 The perfect cookie platter. 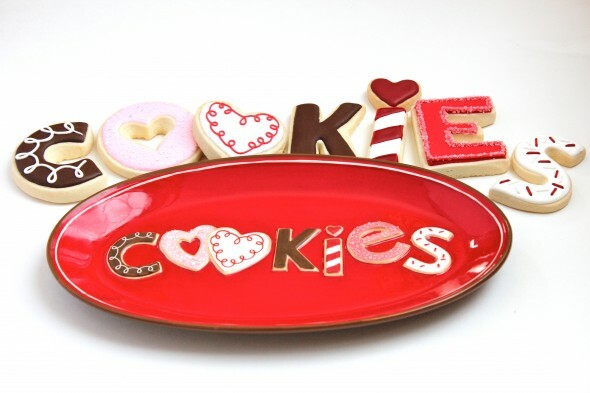 There it was, in all it’s red and pink glory… The word cookie splayed out on the platter, in the shape of cookies themselves. How could I pass it by? Copying these cookies was easy enough. 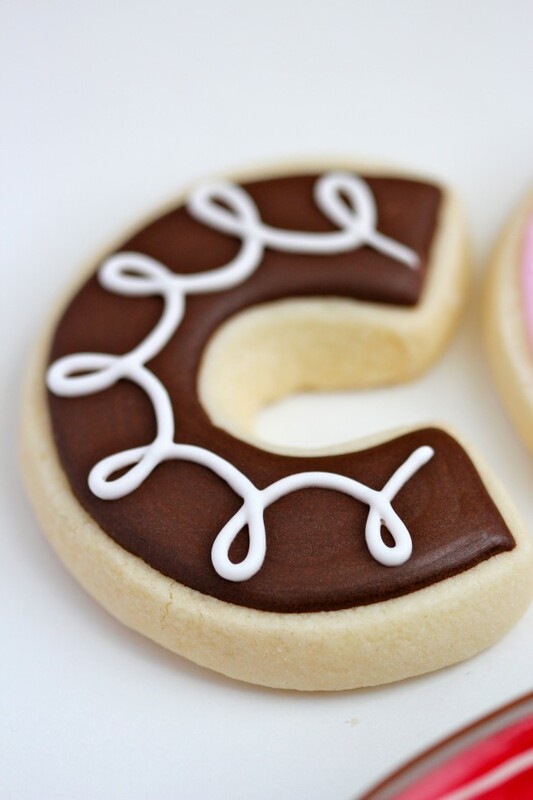 Besides royal icing loops on the C and the heart (the C kept reminding me of those chocoloate hostess cakes and were igniting some serious cravings for one btw), the E (don’t have small e cutter) was lined with clear sanding sugar, and the “sprinkles” on the S were actually royal icing lines. The tricky part was going to be the clear ‘droplets’ on the heart. 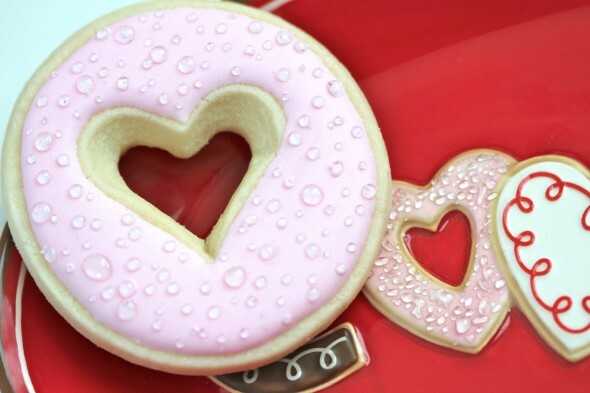 (Which by the way I forgot to make my cookie into a heart shape… I made a circle… Oops). Turns out, it was easy after all. I just crushed up some clear, Trebor glitter mints, put the now powdered candy on a plate lined with parchment paper, melted the candy 10 seconds at a time in the microwave, and was left with little, sweet, water-like droplets. 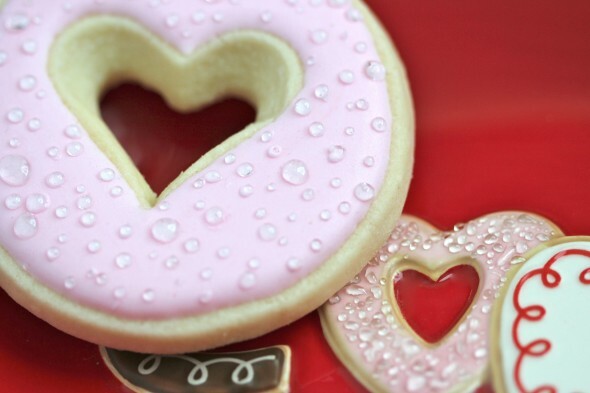 I wish, my dear friends, I had taken photos, but at the time, my head was thinking about this post; 50+ Secrets of a Cookie Decorator. 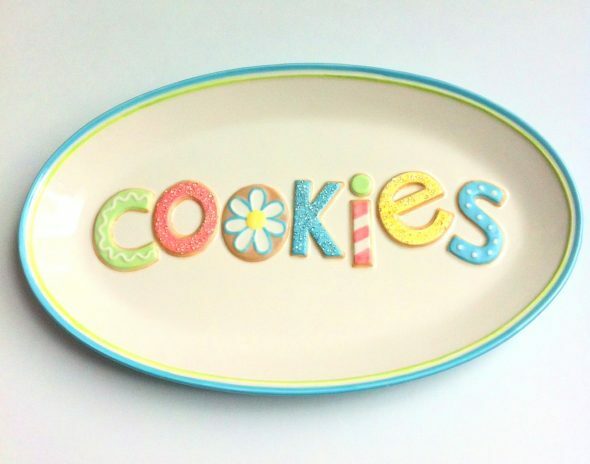 You see, this little cookie plate really was the catalyst for making me think about just how cookie obsessed I really am. Click on over to check it out, and leave me a comment if you’ve remotely thought any of those things before; it would help to know that it isn’t just me. 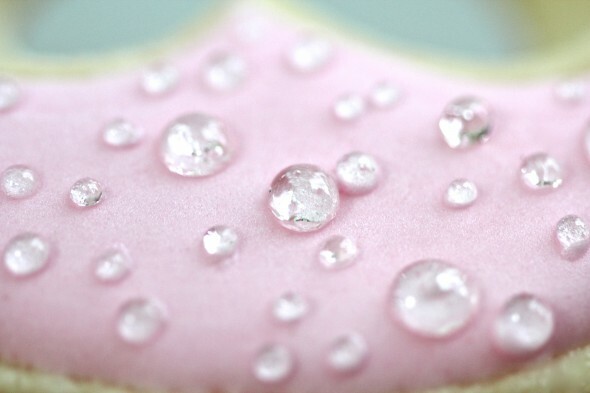 A couple of notes – It takes a lot of the little dew droplets to cover the cookie. Notice how mine are spaced out more than the one on the platter. Got tired. 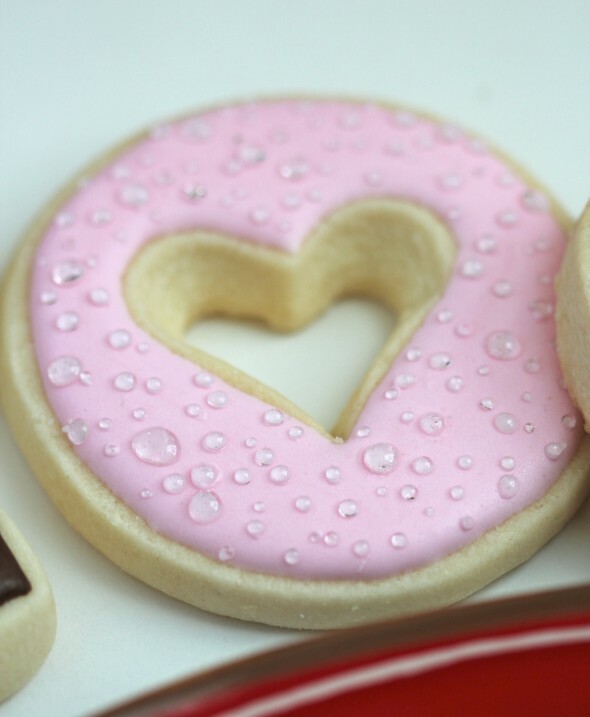 Oh, and a wee dab of royal icing under each dew drop, and tweezers to pick each little one up and attach. 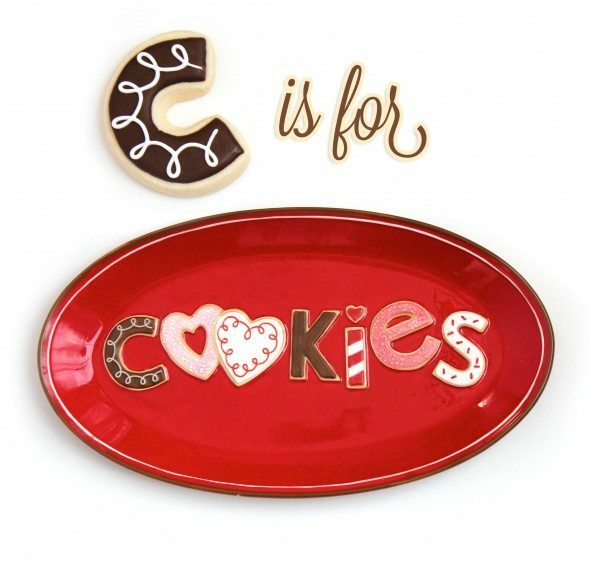 If you were to look closely at the ‘e’ in the platter, you’d see it has the same water droplet effect. 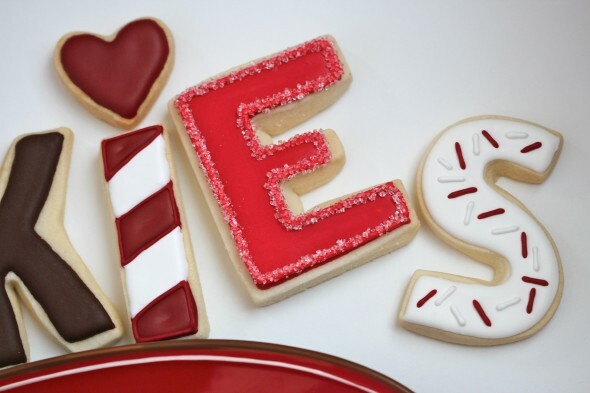 My E cookie doesn’t. Again, got tired. I’m thinking though, if you ever need to make the sugar droplets, I don’t think you’ll need as many. 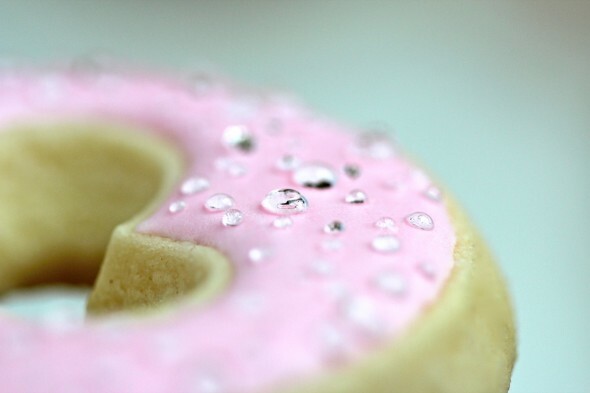 They could work as dew droplets on sugar flowers or leaves, or any kind of water effect for a gingerbread house or bathtub cookie/cake etc. Hope you’re enjoying the weather and life, wherever you are. I know Lionel (our Lionhead bunny), is as excited about spring as I am. On the bottom left instagram photo, he’s waiting patiently by the door for his daily ‘outside play’. The other instagram snaps are of H-banana and my lack of ‘hair-do’ skills, and Mr. Sweetopia with a fluffed up Lionel. 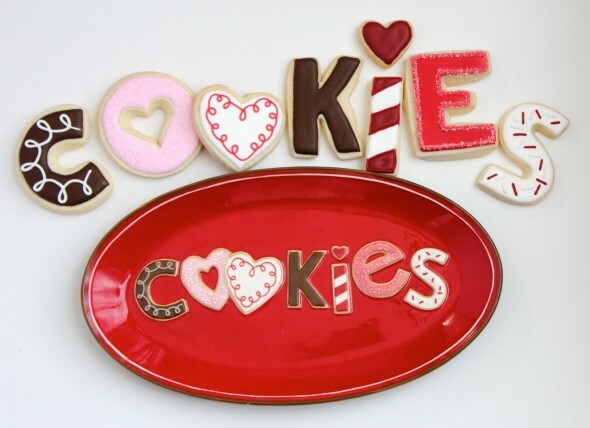 How pretty would those cookies be! Have fun baking and good luck! 10 rolls for 19.99 and free shipping. Finding sources fluctuates/changes over time. I recommend googling Trebor glitter mints and finding the closest source on the planet to you. 🙂 I’m in Canada and they used to sell them at Bulk Barn too. Happy shopping!